In June 1882, Mr. Ray purchased the land for his home. Eleven years later, in 1893, the basement and foundation were built. They were allowed to "cure" for a year before the house was constructed. Bricks for the house were formed on location. Construction was completed in 1894. The Frank G. Ray House is a three-story Queen Anne mansion which the Ray family occupied until the mid-1930s. Murphy and Wallace architectural firm designed the home. The foundations are of Anamosa stone. The building, attic and all, was lit by electricity and "well supplied with electric call buttons." A water motor pumped water from the cistern to a tank in the attic, from which all parts of the house were supplied hot and cold water except the "water closets." From outside the house, one can appreciate the three-story turret with curved windows, various kinds of wood siding, three small fresh-air porches, and the interesting roof line. Throughout the house are leaded glass and stained glass windows and picket doors. The six coal-burning fireplaces are all different in design and wood. The house has a full basement with high ceilings, and a carriage port on the north. In the late 1930s (after Frank's death) the house was converted by Hamilton Tobin into six apartments; a seventh apartment was in the upstairs of the carriage house. The house and carriage house were placed on the National Register of Historic Places in 1984. 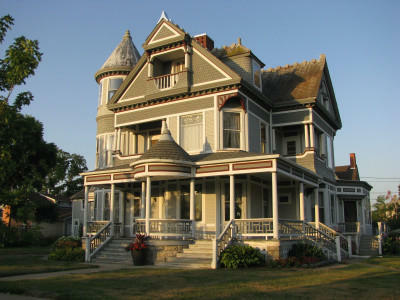 The house remained apartments until 1985, when it was given to the Benton County Historical Society by Casper Guyer. The Ray House Committee of the historical society is in the process of restoring the home to its early splendor. In 1892 Mr. Ray was involved with establishing the Kelley Canning Company. He was vice president of this company when it reorganized and changed its name to the Iowa Canning Company in 1895; later he served as secretary. The company was the largest corn-canning business in the world in 1909, producing an average of 8 million cans of corn annually. Four plants in Vinton, LaPorte City, Garrison, and Shellsburg packed corn exclusively. The two largest plants employed around 250 people during the packing season. In 1899 Mr. Ray was president of the Vinton Telephone Company. He was a founder of what is now US Bank of Vinton and served as the second president of the bank from 1910 until his death in 1935.